Eric Trump was psyched to vote for his dad this Election Day. It's been a long, rough road to get to the end of this election cycle, punctuated with the Republican presidential nominee himself insisting that the election is rigged when he sagged in the polls and flinging insults at everyone from Muslims to disabled people to journalists. But Donald Trump's second son has defended and celebrated his dad every step of the way, and he has the receipts to prove it. That's true even when some overzealous social media posting meant he definitely broke the law, as Eric Trump took a photo of his completed ballot, then promptly deleted it from Twitter — likely upon the realization that snapping pictures at the polls is not allowed in the state of New York, no matter who your dad is. 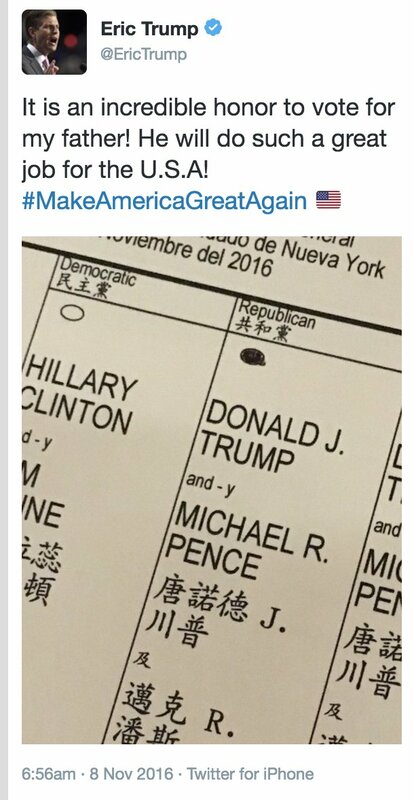 Just before 7 a.m. Nov. 8, Eric Trump tweeted out a photo of his ballot with the bubble above the names of Donald Trump and his running mate, Mike Pence, colored in darkly. "It's an incredibly honor to vote for my father!" the tweet read. "He will do such a great job for the U.S.A! #MakeAmericaGreatAgain." That's a good look for a son who's devoted to supporting said father — but not a great one for an American citizen dedicated to following the law. But no matter how sincere the sentiment, the tweet didn't last long online — at least not on Trump's Twitter profile (it's been screenshotted and will live on in perpetuity elsewhere on the internet). He deleted it, probably because it violated the ban on the colloquially termed "ballot selfie" that a federal judge in the state upheld just days ago, according to New York Magazine. In fact, breaking this controversial and now incredibly relevant law could result in at $1,000 fine or even up to a year in jail. All signs indicate that Eric Trump didn't know about the law when he posted his enthusiastic tweet, but he may well have done it to overcompensate a bit, too. Way back in April, he and his older sister, Ivanka Trump, didn't get to vote for Donald Trump in the primaries, as they'd missed the deadline to register as Republicans more than six months before. "They were unaware of the rules and they didn't register in time," Donald Trump said on Fox and Friends at the time. "So Eric and Ivanka, I guess, won't be voting. They feel very, very guilty. They feel guilty. But it's fine. I understand that." Still, Trump won the state in a landslide even without their votes. He's unlikely to pull off the same feat in the general election, though, as his opponent, Hillary Clinton, has been consistently leading him by double digits in the polls in their shared home state. Eric Trump isn't the only high-profile figure to have become publicly entangled in this legal snare. When he traveled from Los Angeles to Tennessee to vote early, Justin Timberlake also snapped a photo of himself in front of his voting machine, even though Tennessee is another of the many states that prohibit ballot selfies. There are no plans to attempt the prosecute the singer, though, NBC News reported. The same could very well be true for Eric Trump, but the latest voting selfie debacle should be a reminder for all Americans voting Tuesday to check out their states' laws about ballot selfies before tweeting. But no matter what the rules in your state, please, please get out and vote. It still counts without photos, I promise!